bochum welt · tetsu inoue · i.s.h.q. DJ Tools and Information - bpm counters, FAQs, etc. This collection of resources, its presentation, indexes, and Hyperreal-specific content: copyright 1992–2019 Hyperreal or the original creators of the content, as credited within (actual dates and creators vary). 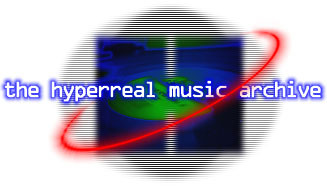 The copyright for all other on-site resources, including virtually hosted domains referenced as being part of Hyperreal the Multimedia Work, is held by the resources' original creators from the date of first publication anywhere; such content is reproduced as part of Hyperreal via negotiated arrangements with the creators. The copyright for content reproduced from external sources, such as public newsgroups and mailing lists, is retained by the original authors from the date of first publication anywhere, regardless of when the content was republished on Hyperreal. To seek permission to use any Hyperreal content in your own website or other publication, please contact the appropriate content owner, or use the feedback form.